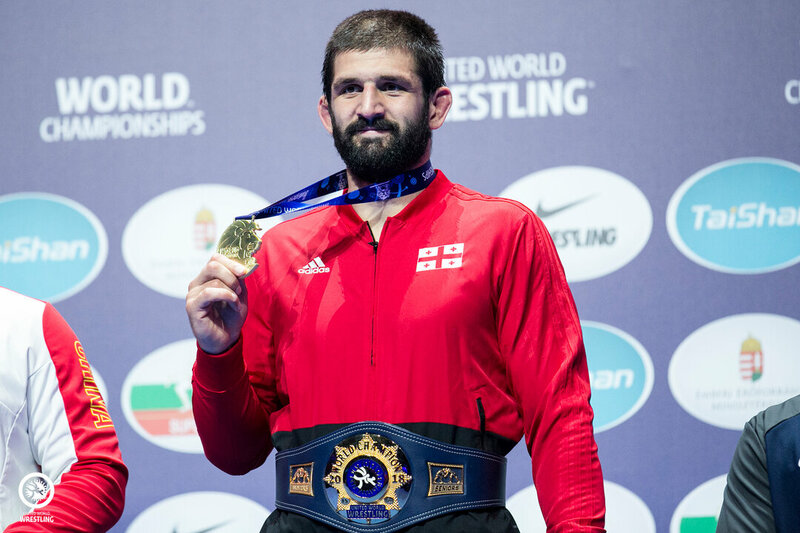 BUDAPEST, Hungry (October 21) -- Zaurbek SIDAKOV (RUS) capped off a magnificent performance in Budapest, claiming the 74kg gold medal at the World Championships on Sunday night. Sidakov edged Avtandil KENTCHADZE (GEO) 2-2 on criteria in the gold-medal match. On Saturday, Sidakov defeated a pair of multiple-time world champions, Jordan BURROUGHS (USA) and Frank CHAMIZO (ITA), en route to the finals. On Sunday, Sidakov, a 2015 junior world bronze medalist, found himself in an early 2-0 hole against Kentchadze after giving up two first-period step out points in the span of 10 seconds. With just over a minute remaining in the opening period, Sidakov fired off a shot and scored a takedown to grab the lead on criteria. A scoreless final period gave Sidakov the 2-2 victory on criteria. In a highly-anticipated bronze-medal match at 74kg, Burroughs edged Chamizo 4-4 in their third meeting of the year. Burroughs scored first off the shot clock and took a 1-0 lead in to the break. A second-period flurry resulted in a 2-2 exchange, which made the score 3-2 in favor of Burroughs. Chamizo took a 4-3 lead after scoring with a step out and unsuccessful challenge by USA. With just under 30 seconds left, Burroughs retook lead on a step out and held for the victory. 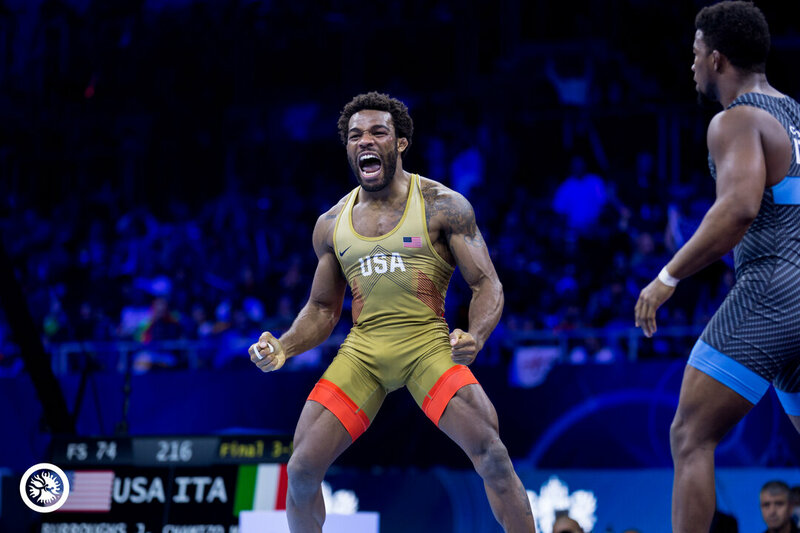 With the victory, Burroughs has now claimed seven world or Olympic medals. It's his second world-level bronze medal to go along with five gold medals. Bekzod ABDURAKHMONOV (UZB) picked up his second world bronze medal at 74kg, defeating Soner DEMIRTAS (TUR) 3-2. Geno PETRIASHVILI (GEO) repeated as world champion at 125kg, shutting out Zhiwei DENG (CHN) 6-0 in the gold-medal match. Petriashvili scored a first-period takedown and led 2-0 at the break. He added two more takedowns in the second period to pull away. Last year, Petriashvili stunned Taha AKGUL (TUR) in Paris to win his first gold medal at the senior level. Many expected the two world champions to meet again in Budapest, but Akgul was beaten by Parviz HADIBASMANJ (IRI) in the quarterfinals. Petriashvili now has five world-level medals. Nick GWIAZDOWSKI (USA) defeated Sumit SUMIT (IND) 7-2 to win his second consecutive world bronze medal. Also winning a bronze medal at 125kg was Hadibasmanj. At 60kg, in a battle of returning world medalists, Yowlys BONNE RODRIGUEZ (CUB) gave up an early takedown to go down 2-0 in the gold-medal match against Gadzhimurad RASHIDOV (RUS). But an explosive five-point throw by Bonne Rodriguez late in the first period gave him a 5-2 lead at the break. It's the third world medal for Bonne Rodriguez. He won bronze medals in 2015 and 2017. In the bronze-medal matches at 61kg, Joe Colon dominated Mohammadbagher YAKHKESHI (IRI) 13-2, while Tuvshintulga TUMENBILEG (MGL) topped Beka LOMTADZE (GEO) 6-3. 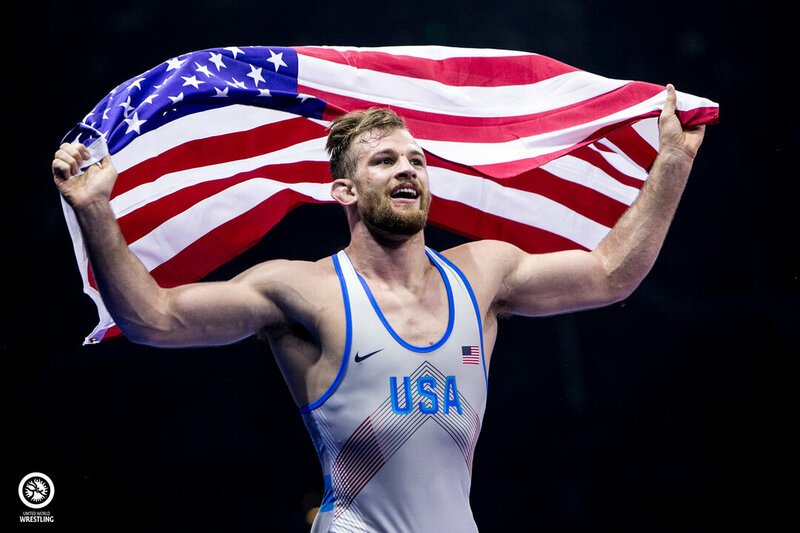 David TAYLOR captured the gold medal at 86kg, giving USA its first gold medalist in Budapest. He rolled to a 12-2 technical fall in the finals over Fatih ERDIN (TUR). Taylor built a 6-2 lead in the first period on the strength of three takedowns. He continued his offensive onslaught in the second period, scoring two more takedowns before ending the match with a gut wrench turn. The 27-year-old American outscored his opposition 48-13 over the two days in his first World Championships. Olympic champion Hassan YAZDANICHARATI (IRI) bounced back from a first-round loss to Taylor to claim a bronze medal at 86kg. He defeated Dauren KURUGLIEV (RUS) 11-5 in the bronze-medal match. It's Yazdanicharati's fourth senior level medal. Taimuraz FRIEV NASKIDAEVA (ESP) won the other bronze medal at 86kg. USA leads in both the team race (120 points) and medal count (4) after the second day at the World Championships. Russia sits in second place, followed by Iran.